This has been an amazing, whirlwind week. As I shared in my last post, we have successfully opened the Upendo Home in Sikhendu, Kenya. Seven precious boys who were previously abandoned orphans on the streets of Kitale are now living in Upendo Home…these are our “Upendo Boys.” I say our boys because although I was instrumental in coordinating this effort here in Kenya, Upendo started as the vision of Pastor Paul Odari of Divine Life Kenya and took the dedicated help and effort of many others who now love these boys as their own, just as I do. In these days following their rescue from the streets, the boys’ personalities and experiences have started to surface. Although they are clearly happy to be at Upendo — elated is more like it — these dear ones suffered a great deal before they were liberated. All of them suffered the rejection of their families when they were left on the streets to fend for themselves. In our first group of Upendo boys alone, we have boys as young as five and as old as twelve. Most have been on the streets for years. Imagine a young child in this scenario. They also suffered the rejection of the society as they are ignored or scolded as they beg for food in their filthy clothes, many without shoes. So what did the rescue look like? First, Pastor Titus went to pick up the boys at a designated rally spot. When he arrived, the initial six boys were there, however, there were also nearly 20 others who had heard about what was going to happen. Pastor Titus had the heartbreaking job of looking into all of those hopeful faces and telling many that this would not be their day. When Titus came to meet us for the start of a long day of transitioning to Upendo Home, he had seven boys total. Two of the boys we had previously expected to rescue were MIA but Pastor Titus had found two really young boys among the group — truly our targeted audience — so this made seven total in a plan for six. When the seven were presented to me, I immediately recognized several that I expected would be there. These were precious boys that I have formed a relationship with over the weeks I have been serving here — Meschach, Davis, Arafat, Joseph and Joshua. The two new boys — Mike and Ibrahim — were unknown to me until that day. If you know my heart, then you already know we did not leave that day with six boys but seven. I just did not have the heart-strength to look into Mike’s face and tell him he would be left behind, nor could I leave the older boys I had already fallen in love with. So instead, I quickly reasoned that although we had prepared everything for six, including beds and clothes, the two smaller boys could bed share and we could quickly get another round of clothes and shoes. So that’s what we did. Next on the agenda was to go to the Kinyozi (barber) to get the boys’ hair shaved. Many times, kids who live on the street have skin problems, worms, fleas and jiggers (burrowing, flesh eating fleas). Once the boys’ heads were freshly shaved, a bath was next on the agenda. But this was no ordinary bath. Where does one take seven boys to bathe in a city where they are not welcome? The car wash of course! Here locally, the car washes are done by hand and when we previously rescued Junior, the car wash worked perfectly. So we carted all seven boys to the car wash. They strolled across the street to an open field, where they stripped off all of their worn, filthy clothes and got a washing from head to toe. Of course for this part, I remained at a distance as I did not want them to be embarrassed. After all were clean, they got dressed in their new clothes and shoes. Talk about bright and shiny new! They felt so proud and I imagine so acceptable. Following the bath, it was time for lunch. We took the boys to the local Nakumat center where there is a nice restaurant. The boys were so happy and confident as they strutted right past the guards that would previously have stopped them. Meschach laughed as he told us these very guards who would have previously scared them off or even caned them to get them to leave were now “saluting” them as they walked by (that is Meshach saluting in the picture above). No caning this time and not ever again. Our precious boys sat at a nice table with linens and were able to order whatever they liked. Most chose chicken and chips (French fries) and a soda. All were very grateful. Next up was a trip to the doctor for a head to toe check up, including blood work. Most of the boys thought getting their blood drawn was cool. We were elated to learn that not one of them is HIV positive…such a common issue for many kids here. In addition, not one of our boys had jiggers either. Aside from a few mild and treatable ailments, all were in good health. Praise God! After this, we took the boys to the Upendo Home. They were shown their new surroundings, including their own room stocked with six new bunk beds and more clothes and provisions. You have never ever seen such joy and gratitude than what we saw that day. On Sunday, the boys came to church and I had the opportunity to introduce them and talk about them with the great pride I have. These boys — despite all they have suffered — are truly amazing. They are sweet, happy, and very talented. They all have dreams and aspirations like any child should. It made me so sad to think that because of some horrible circumstances they had faced, their gifts to the world could forever be hidden if left on the streets. Nearly every Upendo boy has already spoken of wanting to help the other kids who remain on the street. The older boys on the streets are pleading for their turn too. These are boys who did not have an early intervention like our Upendo Boys. But we are not giving up and we have told them not to either. I leave my beloved Kenya in just over a week. My heart is already breaking at the thought of leaving these precious ones that I love so much. With the help of translation by my equally beloved Enoch, who is working with the boys as a Social Worker and mentor, their “Mama Karen” was able to explain to them that I must return to America very soon. In fact, the last day I will see them is Friday — just four days away. While I watched a range of emotions pass across their precious faces, I also assured them that they are welcome and wanted, that I love them deeply, am so proud of them and am committed to continue to help them. They asked how soon I would return and I told them I would come back as soon as I can. I also let them know that I have made sure we have a strong Kenyan team in place to support them. And we do, including an amazing Upendo guardian family who already had three boys of their own. These precious people are now are raising ten boys! Finally, I told them to make me proud and to remember that they’re so blessed to be at Upendo. They promised me they would do their very best. I just don’t know how I will be able to walk away from them on Friday. I know my heart will break in a million pieces. Friends, this has been the most incredible ministry experience I have ever been a part of. To have the love and devotion of these precious boys is unlike anything I have ever known. I am fiercely committed to seeing this through…and looking forward to watching these boys become strong men who will make a difference in Kenya. But I cannot do it alone. I don’t believe I’m meant to. Most everyone I know lives a life of great comfort, well above anything that a street boy in Kenya will ever know. I am asking you to help me by sharing financially whatever you can to help support Upendo. Trust me, we will make excellent use of every dollar so even if you can only support a little, it will help immensely. Will you please consider either a one time or monthly donation or perhaps commit to sponsor a boy to help us? In my next post. I will share pictures and more details of each boy who needs to be sponsored. Perhaps you can forego buying coffee or dinners out on occasion, team up with a work group or with the holidays approaching, how about considering scaling back what you will spend and donate the difference to Upendo. We would be ever so grateful. You can either donate online via our fundraising page or for a tax-deductible donation of $100.00 or more, message me @karenmichaelle@icloud.com for instructions. And would you also please spread the word? May you be ever so blessed as you bless our boys with your support. To see more of Upendo, including many photos, please visit our Upendo Facebook Page. Everyday miracles really do happen. I know, because I’ve just participated in one. This miracle began, was formed and unfolded and completed right before my very eyes. To have had a hands-on role in this miracle is something that I will never forget – it has truly been one of the most amazing experiences of my entire life. By this, I believe Jesus was saying that His followers — if they remained open to being used by Him — would be called far and wide, across the earth, to be used as modern-day miracle agents with the Holy Spirit as the guide. I can tell you this is how I would describe the experience I just had. When I came to Kenya, it was primarily to focus on women. This is a clear call of God on my life. But I also knew God would have other plans for me as well and a calling to step in the gap as an advocate for the orphaned street children of Kitale was soon set before me. What started out as participating in a weekly feeding ministry with Pastor Paul and Pastor Titus of Divine Life Kenya then became a determination to rescue just one boy – Junior — who had instantly captured my heart. Within just three weeks of arriving in August, we were able to do just that. That itself felt miraculous. But what I would soon learn is that this act of advocacy for one boy was not the end of the story; not even close. As I continued to visit the boys each week, my heart continued to expand for them and my motherly concerns for their plight grew. When it rained outside (a regular occurrence here) I’d wonder where they were seeking shelter. When I had a fresh meal placed before me, I’d think back to the first day I met some of the boys and saw the garbage heap they’d pick from to eat. My sense of injustice and restlessness grew as my days in Kenya became fewer. I just knew I had to do something tangible had to be done before leaving for the states. And guess what? We have! I am SO exited to share that we have opened Upendo Home! Thanks to the fundraising efforts of a few precious ladies who leapt into action without even being asked and the generosity of supporters, in just three weeks we were able to build a simple home — our first Upendo Home! 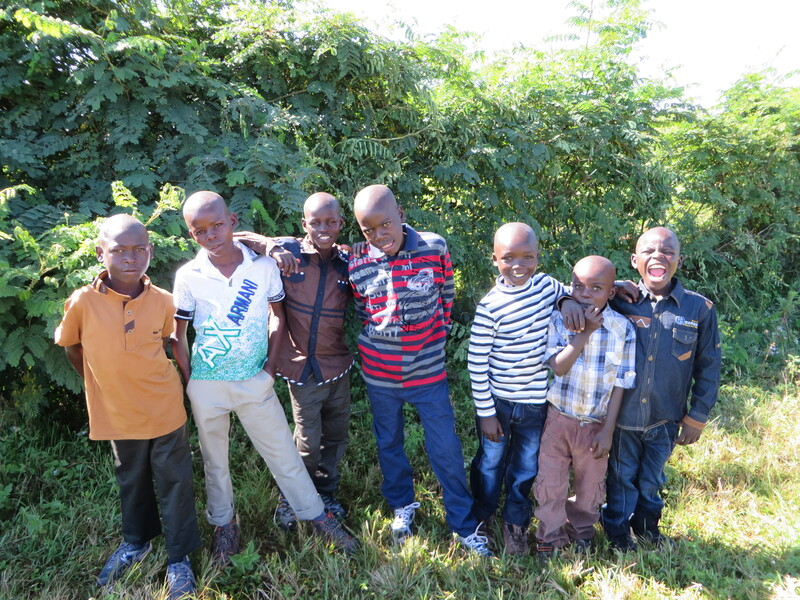 Just yesterday, we rescued seven more boys from the streets of Kitale! This new home now hosts a guardian family and seven precious young boys who have started an all new life. For them, gone are the days of constant hunger, exposure to the elements, rejection from the society and no one to love them. In the coming days, I will be sharing more details about the stories and these precious boys. Think miracles don’t happen today? Ask our Upendo boys…my bet is they will assure you they do! Want to help? We surely need it! Please visit our fundraising page. In my last blog, I shared that “hope” is what brought me to Kenya. It is indeed that desire that brought me here. It is that hope and my love for others that resulted in my decision to commit to a three-month season of serving alongside my brother and sister in the faith, Pastor Paul and Mary Odari of Divine Life Kenya (DLK). The best way to describe these two amazing people is that they are the real deal. They are humble servants who are actively shepherding their community as God has called them to do, most times sacrificially. It is that kind of love that brought me to Kenya. I arrived in Kenya on August 22 with the primary goal of ministering to women; a calling on my life that God has made undeniably clear. Following my primary commitment as key note speaker/teacher at a three-day women’s conference at which, to my surprise, I saw that many local pastors were also in attendance, I have been invited by these pastors to teach their congregations at various churches nearly twenty times now. Every time I have prepared a new message, God has used it for just those present. It’s been remarkable to hear how my messages line up with their current issues or concerns. So ministering to women has most certainly been a key focus for me. In addition to groups, I am also providing leadership training to the church staff and mentoring ladies one on one. One in particular, a single mom who had really suffered some serious life-blows, meets with me weekly. Her transformation through God’s truth and hope has already been amazing and inspiring! So while I’ve certainly been used to minister to women while I’m here, what’s been unexpected — what I could not possibly have known before coming to Kenya — is what else God had in mind for me to do. First, God has given me a deep love for Kenya and the wonderful Kenyan people. And while I desired to serve this community, what I didn’t expect was this community to become my community. Yet they have. I love this community so much and it is an honor to be here. I have never felt so respected and appreciated and so well-cared for. The name Kenya does not technically mean love. But to me, it surely does. This leads me to some of the other projects I’ve been working on here and to my bold “ask” of each of you. First, as you read this post, kindly take the time to read the details I will share below. And while you do, please consider how you can help. In return, I know you will feel the incredible satisfaction that comes when you show love to others who are so in need of someone to care. Upendo Home: Upendo means love and love is our goal. There’s an estimated one thousand orphans on the streets of nearby Kitale Town. Think of them like this. They have no parents or protection, no food, no shelter, no school…no love. About two months back, I helped rescue one of these boys, Junior, from the street. I shared about this in my post “Rejected.” Junior now lives with the Odaris and is doing remarkably well. Since rescuing Junior, the other boys recognize me and are wondering when it will be there turn. Every time I see them, I assure them we are working on it. Each time I have to walk away without taking another boy, my heart breaks for them a little more. This last week, as we were giving the boys food, they were telling me God was going to bless me! Yes indeed. 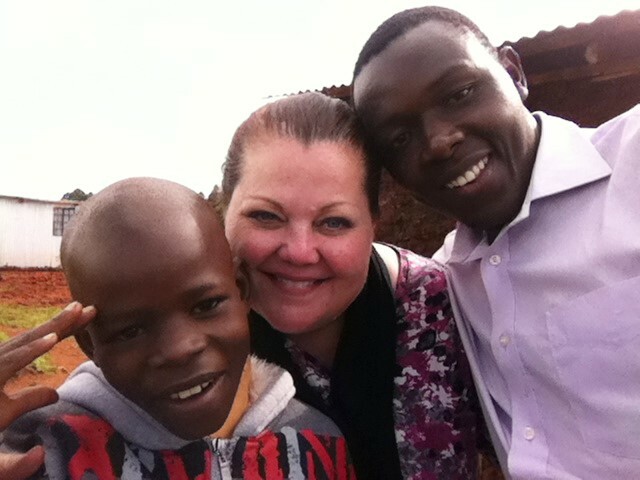 While our initial large goal is to raise $70,000 US to build a permanent home to house 20 boys, this week after leaving them yet again, I knew that I simply could not leave Kenya without getting something started. With many thanks to the dedicated fundraising efforts of just two ladies stateside — Joyce Pratt and Nina Olivos — we’ve figured out that for around $1,000 US, we can afford to build a simple, temporary home to get six more precious boys off the street by the end of October. In fact, we broke ground today on the church property and by the end of October, six more precious boys will learn just how much love we have for them as we welcome them to their new home! How you can help: Your one-time or recurring donation will help with the monthly costs to support the boys and toward the funds needed to build the formal home. Before I leave for the US in early November, I’ll also be posting pictures of our fist six little loves and asking for personal sponsors for each of them. I will stop here. This is an incomplete list but three of the most pressing needs. I will share others in a future post. I give you my solemn promise that every dollar you donate will go directly to the ministry need with no overhead cost deducted whatsoever. You can donate for a specific cause or you can make a general donation and we can share what we do with it. Love. The greatest gift we can offer. We need you to help share love with others. So will you please? I hope you say yes and I am awaiting your reply. Please message me at karenmichaelle@icloud.com, via blog comment or send your donation now via PayPay to karmib@msn.com. (If possible, please round your donation up by the 3.1% service fee) Thanks so very much from the bottom of my heart and the hearts of the amazing people of Kenya. If I could use one word to share why I left my traditional life behind and came to Kenya it would be this: Hope. Many years ago, I lacked hope. In fact, I was in such despair after my unexpected and heart-shattering second divorce that I thought I would never feel anything but despair. When I looked at how my life had been up until that moment, my wake of relational-failures and my downward spiral into self-disdain left me feeling utterly hopeless about my future. But I was wrong. After seeking for years, nearly my whole life really, to find that which my inner heart and soul needed most–in relationships, in substances, in so many things–I found the real solution to my need. Or I should say, my solution finally got my attention. Christ. In hindsight, I actually knew that God had been tracking me for some time; trying to get my attention. But I was running, wanting to do life “my” way; not live by some sort of rules. It sounded like foolishness to me. But as I finally admitted doing life my way was not working for me, and I began “kicking the tires” of Christianity a bit, it wasn’t long before I realized it was me who had been so foolish. I accepted Christ and my life has never been the same. Yielding my desires to seek the way God instructs his children to live — for their own benefit — has resulted in the most dramatic personal transformation for me. Those who know me well know how true this is. Today, hope always prevails. So it’s that hope, God’s hope, that brings me to Kenya. I am not here to convince others of Christ…that is God’s job. But what I am here to do is to share the hope I found in Christ. My primary call is to teach, encourage and equip women in the faith. This strengthens them to live lives better-rooted in God’s truth, which then influences their families and so on. And that is primarily what I have had the privilege to do. In fact, since arriving on August 25, I have already shared messages of hope and God’s love and promise at fifteen events with many more to come. This is such a privilege of great blessing. The women here are often abused and mistreated and they are so eager for a word of hope. My heart expands every time I get to share God’s hope. Why? Because I am a firm believer that we all need it. Regardless of the status or condition of our lives–even if we are wildly successful from society’s standards–I am convinced that in each of our souls, there is a place that is God-shaped that only He can fill. When hope fills the darkness, we’re then also able to look outside of ourselves and help others. There is something remarkable that happens in our own spirit when we do. In my next blog, I’ll share some of the tangible things I’ve done to help those in need here in Kenya. I’ll also share how you can help bring hope to another. I hope you will read what I share, More than that, I hope you will respond to help. The needs are great. The workers are few. The resources are limited. But if many people do a little, it all adds up to something big; something life-changing for the one who so desperately needs to know that someone cares enough to step in the gap for them. Hope. It’s why I’m in Kenya. Who else will join me?